As Spanish protesters continue to rally outside the headquarters of financial institution Bankia in Madrid, a proactive group within the movement have taken their point further and filed an official criminal complaint against the former management of the bank . Like many other nations around the world the Spanish people face crippling austerity due to the bailing out of the corrupt global financial system, which collectively crashed the world’s economy due to reckless lending and fraudulent investments. Bankia, which was bailed out and partially nationalised like Britain’s RBS, was a causative factor in Spain’s spiraling debt crisis, and in order to loosen the immediate burden the Spanish Government are to accept a massive EU bailout package, which will be the responsibility of the people to pay back through cuts, taxes and privatization. Former Bankia President Rodrigo Rato, who took the position after leading the International Monetary Fund between 2004 and 2007, is a key figure in the Bankia lawsuit. He along with several members of the bank’s board are accused of falsifying accounts and providing fraudulent information to shareholders, who were kept in the dark about the institution’s shady practices and were lead to believe it was in a better position that it really was. Despite the allegations Rato has had the gall to ask for a severance payment of 1.2 million euros from Bankia so he can move on to greener pastures in the financial industry. Citizens however have been left with their head barely above the water. 13 of the bank’s shareholders who are represented in the complaint lost thousands of Euros each after initially being told the company made a net profit of 309 million euros in 2011. In reality the bank actually lost nearly three billion euros. Instead of criminal proceedings the crooks were rewarded with a 19 billion bailout from the Government, tipping the country’s financial burdens over the edge and forcing the nation itself to seek its own bailout from the EU dictators. “I feel like I was completely deceived,” said 37-year-old Carlos Blanco. “This is only the beginning,” claiming to have “inside information” that also implicates the Bank of Spain and its former governer, Miguel Angel Fernandez Ordonez, in the fraud. Citizens have come together to let the Government know that they’re not “all in this together”; the fault is not theirs and the debt burden should be on the doorstep of the banksters not hardworking citizens. Over 19,000 euros was raised through an online campaign, which helped fund the legal proceedings. “We want to show that there will be no more impunity. Those responsible must go to jail,” said a spokesperson for the movement. In a picture the world is now all too familiar with protesters have been met with a heavy hand by state police , who rather than arresting those that caused the mess, have been using excessive force against those who want to see real change to the financial system. However protesters aren’t all peaceful, and really who can blame them? Spain is the fourth biggest economy in the eurozone but has essentially been sold down the river to financial crooks. They’re stuck in a double-dip recession with a quarter of the population out of work, including half of young people. Spanish coal workers are at the forefront of austerity and have decided enough is enough. 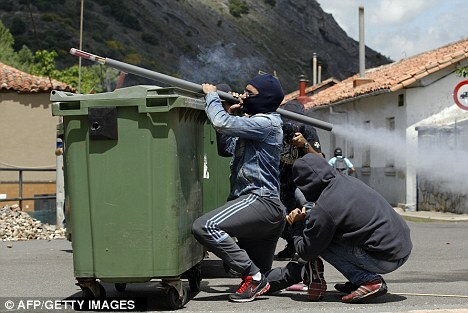 Armed with homemade rockets, slingshots and rocks they have managed to force officers completely out of the town of Cirena in northern Spain . Like Greece, Spain threatens to sink the Euro dream. Perhaps this is a sign that that’s all it was, a dream, and that nation states would be much more stable if they were allowed to regain their sovereignty and put their own people first.